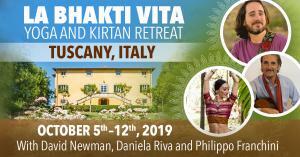 Join David Newman, Daniela Riva and Philippo Franchini for a Bhakti Vita Yoga and Kirtan Retreat in Tuscany. 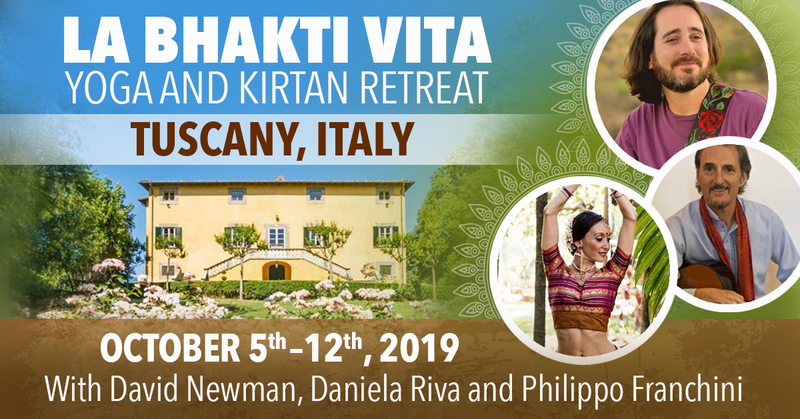 Lovers of beauty, yoga, kirtan, music, shanti, and maybe even chianti, join us for this special retreat in glorious Tuscany, Italy! This magical retreat will take place at the elegant Villa Arsina for one week in the inspiring Tuscan countryside, on an estate with gorgeous private grounds and a swimming pool. Together, we will enjoy chanting, yoga, heart wisdom from the Bhakti tradition, and delicious local cuisine. There will also be opportunities for organic wine tasting, horseback riding, biking and hiking. Our gathering, will be both a yogic and Italian culture immersion experience, situated just 5 minutes from the enchanting, medieval town of Lucca, 25 minutes from the famous beaches of Viareggio, Forte dei Marmi and Torre del Lago, 30 minutes from Pisa and 1 hour from Florence. The retreat is a once in a lifetime adventure to taste the sweetness of the Heart, in the Heart of Tuscany! It will also be quite INTIMATE, as attendance at the villa will be limited to 15 people, so register now before it’s sold out! Your retreat facilitators will be world renowned sacred music and chant artist, David Newman, noted composer and Musical Alchemist, Philippo Franchini, and Daniela Riva, master teacher of yoga and Indian classical dance. -Both Daniela and Philippo are fluent in Italian, and will be able to guide participants in navigating the local activities and attractions. If you are buying a retreat ticket only, you are responsible for securing your own housing through Airbnb or local Inns. A list of local lodging can be provided upon request.